The insignia of the 510th Bomb Squadron, 351st Bomb Group. Crew of the B-17 42-31763, "Ten Horsepower", 351st BG, 510th BS. Back Row, L-R: S/Sgt. Archibald Mathies; Sgt. Joseph F. Rex; Sgt. Carl W. Moore; Sgt, RussellR. Robinson; Sgt. Thomas R. Sowell; Sgt. Magnus A. Hagbo. Front Row, L-R: 2nd. Lt. Clarence R. Nelson; F/O Ronald E. Bartley; 2nd. Lt. Walter E. Truemper; 2nd. Lt. Joseph R. Martin. 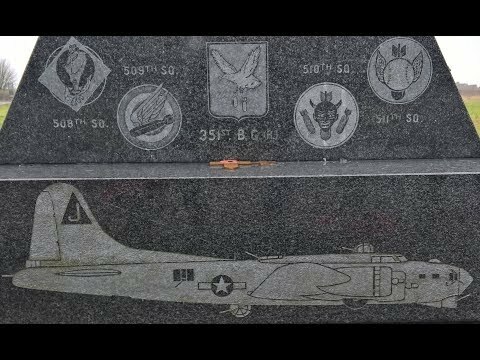 Video and photographs of the memorial to the service of the men of the 351st BG(H) who served at Polebrook, station 110. Written by 1st Lt. Ira Wellins: "April 18, 1945. Railroad Marshalling Yards, Traunstein, Germany. Standing: 1st Lt. Swift-2nd Navigator; 1st Lt. Ira Wellins-Mickey Operator; 1st Lt. Leibrock-Tail Observer; Maj. Gorham-Air Commander. Kneeling: 1st Lt. Austin-Bombardier; 1st Lt. Madsen-Navigator; Capt. Wilcox-Pilot. Madsen's last raid.--and mine!" "Lt Lunan of the 351st Bomb Group, wearing the Distinguished Flying Cross and Air Medal. England 12-Jan-45." "Lt Windes wearing the Distinguished Flying Cross. 351st Bomb Group England, 21-May-44." Major David Wheeler alongside the noseart of B-17 42-31721 Black Magic 351BG, 8AF. Assigned to 510BS, 351BG, 8AF USAAF. Detached service (DS) with 1st Scouting Force. Ended Tour Duty (ETD). Prisoner of War (POW). Leg was injured in B17. Bailed out near Zuidlaarder Meer in Holland and was captured.